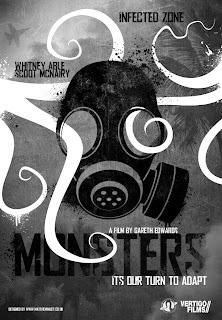 My husband and I rented the indie film "Monsters" a few weeks ago. 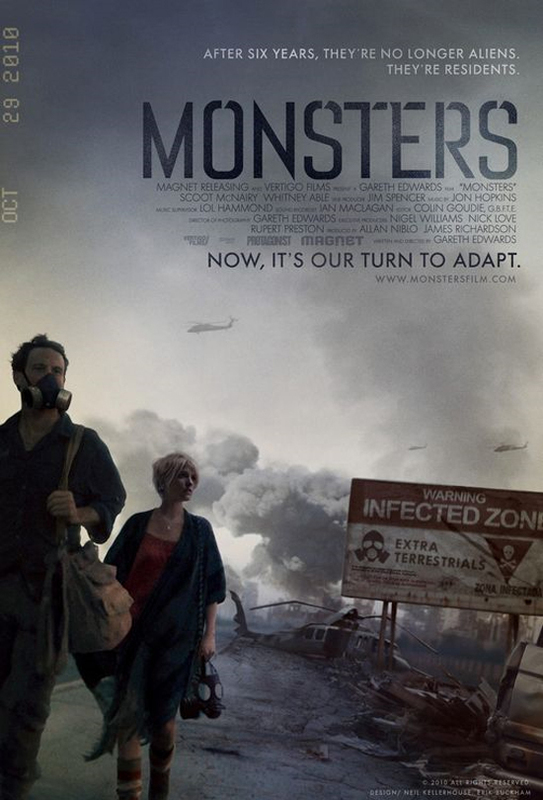 It was just one of those lazy Sunday afternoons and I'll watch just about anything with "monster" in the title. What I thought might be a fun escapist flick turned out to be more. So much more that I ended up teaching it in my Intro to Creative Writing class. So much more that I found myself shedding tears at the touching and meaningful ending. Monsters might be the perfect screenplay. It's a prime example of literary (meaning character-driven) storytelling. One of those movies that film-lovers can use to justify their dollars spent at the multiplex, their hours wiled away in front of the television searching for that emotional high only a really great story can provide. The film is quiet and often times dark. I mean literally dark. Most of the budget went to special effects, but the naturalistic lighting only serves to deepen the mystery and danger. Like the characters, we never know what's just around the corner. It sounds funny to say, but I haven't been this enraptured by a film of this genre since Jurassic Park. Though both films have helpless humans running through the jungle from giant creatures, they couldn't be more different. Monsters is all about the characters, Jurassic Park is more about the plot, the scenes...and those beautiful animatronic dinosaurs. Monsters gives us long stretches of silence in lieu of over-expository dialogue. It gives us bits of background information, but leaves us to piece together the puzzle on our own. The result? A careful, focused product. This film draws you in and occasionally makes you hold your breath. That's the power of good writing and intentional pacing. As soon as the scene cut, everyone readjusted in their chairs. I heard the entire room literally take a deep breath, then let out a controlled sigh. This movie had their full attention. So what is it about the film that makes it work so well? Is it the simplicity of story, the nifty effects, or the casting? All of that was crucial, but more than anything else, the script laid a firm foundation. The situation is what we usually think of as "plot". It's the details. In Monsters, the situation is that a young freelance photographer must take a detour during his assignment to rescue the boss' daughter from what is known as The Infected Zone. This is where extraterrestrials (more animal than conventional movie aliens) have landed on Earth and are now taking over the planet's ecosystem. That's the situation. But the story is something entirely different. The story is what the situation brings out of the characters. How do they relate to one another? What do they discover? On a larger scale, what does the human reaction to these extraterrestrials say about the world itself? The story is full of allegorical potential. I'd be willing to bet that there are as many different interpretations of what the movie is really about as there are people who have watched it. Horror is an ideal genre for sending a message. If George Romero's Dawn of the Dead was about our obsession with consumer culture, then Monsters is about our age of paranoia related to...well...anything really. Immigration, education, or any hot button issue that gets discussed by the talking heads on Sunday political shows. This movie is about "Us vs. Them" and it's possibly it's an eerie harbinger of things to come. This is how Monsters soars. The writing invites you into the story. "What do you think?" it wants to know. You must participate. On top of that, it's just plain beautiful. Like "Be Kind, Rewind" or "American Movie", the film can at times feel slow and meandering. Any movie that tries to do something truly unique may be off-putting or confusing at first. But in the end, all threads weave together to create definitive points. When I watch it, and that's twice now, I feel deep emotion. I want to perform some act of compassion. I have to hug my husband. It sort of makes me want to sell some of my belongings...can't really exactly explain that one yet. The half-life and emotional impact of this movie lingers long after the credits roll. The movie, though fictional, leaves you with internal questions you simply must answer. It's disturbing in the truest sense of the word. If you haven't seen it, watch the preview below and give it a shot. It's the perfect mixture of think-piece and thriller. I've been so burned out on "let's watch the world explode" movies that I went out of my way to avoid "Battle: Los Angeles" and other recent disaster movies. But this one is worth it, this one is redemptive and oddly positive, the definition of an efficient screenplay, an example of what the "run and hide" genre can really do and above all else...fun to watch. Retro Orlando - Wherefore Art Thou Dreamfinder?